Right off the bat, HBO’s fantastic new light-drama Togetherness from The League‘s Mark Duplass and his brother Jay Duplass feels familiar, that is if you’re a fan of FX’s great comedy Married with Nat Faxon about a thirtysomething married couple in Los Angeles grappling with the real-world issues facing adults with kids and their yearning for their more carefree 20s. That’s because Togetherness mines exactly the same turf – married thirtysomethings in L.A. facing adulthood while longing for simpler times. But Togetherness, which leans heavier toward drama than Married, gradually emerges as its own, fantastic show about a group of friends living their lives and helping each other out: Mark as Brett Pierson, Melanie Lynskey as his wife Michelle, Amanda Peet as Michelle’s sister Tina and series co-creator Steve Zissis as their aging, chubby and balding friend Alex who’s thisclose to giving up his dream to be an actor. It all feels real and relatably funny. Brett works in Hollywood as a sound engineer – a good gig that gets him home in time for dinner every night. But he’s an overlooked guy in the shadows who pompous directors can barely look in the eye. Brett – perfectly portrayed by Mark – is content with his life, if resigned to being just a working stiff in Hollywood. You can practically feel Michelle’s half happiness with being a married mom who spends most of her time in the house. One bath-time too many and her slipping out on her own one night in heels, a tight-fitting dress and a cigarette in her hand feels like she’s hitting the clubs for the rest of us. Tina, a free-spirited party planner in Houston, literally packs up her life and moves it to her sister’s house in L.A., where she becomes an unlikely cheerleader for down-on-his-luck Alex. Their lives intermingle on Togetherness so effortlessly that it’s hard not to find yourself rooting for each of them to beat the odds and succeed in Hollywood -and in life. 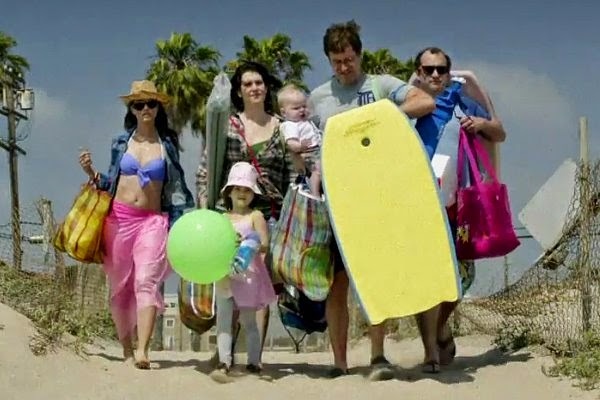 Togetherness is currently airing on Sky Atlantic Read more US reviews on TV First Look.